Adobe has introduced a host of improvements and new capabilities to Illustrator CS5, its flagship vector drawing program. Among them are perspective drawing, a bristle brush, and integration with its new Flash Catalyst CS5. 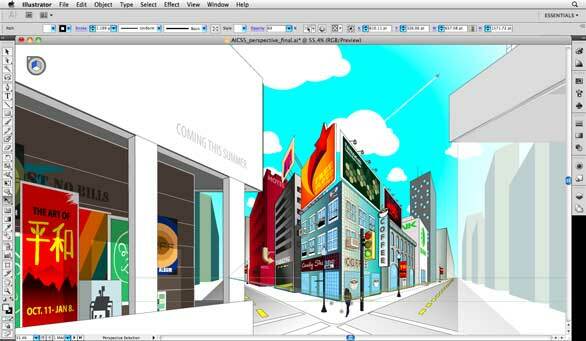 Illustrator CS5's new Perspective Grid tool lets you draw shapes and scenes in accurate 1-, 2-, and 3-point linear perspectives. The new Perspective Selection tool lets you move, scale, duplicate, and transform objects dynamically in perspective. You can also move and duplicate objects from one plane to another. Users can now control stroke width at any point along a path, align dashes to corners and path ends, add accurately placed arrowheads from the Stroke panel, and control how brushes stretch along a path. Set up perspective grids and create objects anywhere on the grid. The new Bristle Brush lets you paint with vectors and mimic real-world brush strokes. You can set brush characteristics like size, length, thickness, stiffness, shape, bristle density, and paint opacity. Improvements in content creation for Web, mobile, and gaming devices include the ability to align your work to a pixel grid and create readable text via anti-aliasing. You can easily move your project between Illustrator and the new Flash Catalyst as you plot and design your layout, and then add interactive elements to it without coding. Expanded artboard options in Illustrator CS5 include a full Artboards panel, where you can name and reorder artboards and work on a variety of related projects in a single file. Additional improvements include a Shape Builder tool to combine, edit, and fill shapes on your artboard; various drawing and symbol enhancements; and resolution-independent effects. With Adobe CS Review, part of Adobe's new CS Live online services, users can create and share document reviews online from within Illustrator CS5. Illustrator is $599 with an upgrade price of $199. It is also available in the Design Standard, Design Premium, and Master Collection. It runs on OS X 10.5.7 or 10.6. Illustrator CS5 ships within 30 days.